Joe Sarro took five wickets for Bexhill in the defeat to St James's Montefiore. Joe Sarro’s maiden five-wicket haul for Bexhill Cricket Club couldn’t prevent a defeat against in-form opposition on Saturday. 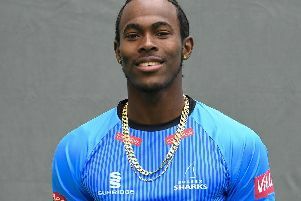 The tall teenage opening bowler took 5-46 from nine overs as Bexhill went down by 83 runs away to a St James’s Montefiore side which has won six and drawn one of its last seven Sussex Cricket League Division Two matches. After Bexhill won the toss and chose to field, St James recovered from 22-2 and 45-3 to post a strong total of 243-8 from their 45 overs. Sarro landed a double blow when he had opener Harry Rollings caught by Shawn Johnson for two and then dismissed number three Tom Prideaux De Lacy in identical fashion for a third ball duck. Bexhill’s other opening bowler, Byron Smith, was rewarded for a miserly spell of 1-15 from nine overs, four of which were maidens, by having Jack Carson caught behind by Will Smith for nine. Then came the St James recovery. Sam Cooper and Henry Sims put on 53 for the fourth wicket until opener Cooper was leg before to Danul Dassanayake for 57 off 68 balls. That was followed by a crucial fifth wicket partnership of 104 between Sims and Ollie Bradley which took St James past the 200 mark and put them on course for victory. It was eventually ended when Sarro had Bradley caught by Neil Blatchly for 47 from 51 balls. Sarro claimed his fourth and fifth wickets with the score 228. He firstly bowled Sims for a game-high 70 off 86 balls with six fours and three sixes and then got rid of Jordan Shaw in the same fashion for a second ball duck to complete his five-for. Matt Peters bowled Jordan Rollings for 22 off 17 balls right at the end to earn Bexhill, who used eight bowlers, a couple more bowling points. Bexhill were all out for 160 in 40 overs in reply with eight players caught and one stumped. Although six batsmen made it to double figures, none went beyond 35 as Sam Rattle took 5-31 from nine overs. The visitors got off to a bad start as Ian May, promoted to open, was caught first ball and they were 25-2 after Blatchly was out for a brisk 22 off 25 deliveries. Bexhill staged a partial recovery until losing two wickets with the score 60, firstly Will Smith for a determined seven off 55 balls and then Dassanayake for a golden duck. A big ask became almost impossible after Cameron Burgon fell for 30 - his seventh score of 30 or more in a season which has brought him more than 400 runs - and Haffenden went second ball, leaving Bexhill 79-6. That became 98-7 after Liam Bryant was dismissed for six. The game was up, but Bexhill at least showed some lower order resistance with the final three batsmen all reaching double figures. Sarro followed up his bowling with a run-a-ball 14 until becoming Rattle’s fifth victim with the score 123. Bexhill added another 20 runs before number six Johnson was out for 35 off 39 balls - the highest score of the innings. Last pair Peters (10 not out) and Byron Smith (12) earned Bexhill another batting point by reaching 160 until the latter was bowled by Shaw. Sussex Cricket League Division Two standings (all played 15 matches): 1 Three Bridges 351pts, 2 Mayfield 346, 3 Billingshurst 302, 4 St James’s Montefiore 300, 5 Haywards Heath 280, 6 Chichester Priory Park 234, 7 Bognor Regis 224, 8 Ansty 201, 9 BEXHILL 189, 10 Lindfield 146.